One of the great things about working on the biography of Crockett Johnson and Ruth Krauss (due out in the fall of 2012) is getting to talk to interesting people. One of the sad things is that many of them pass away. 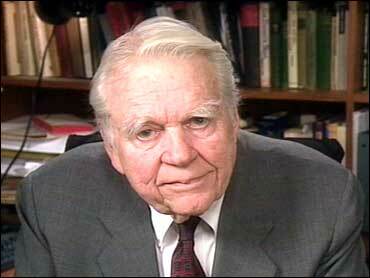 I just learned that Andy Rooney died last night, at the age of 92. His was one of my earliest interviews. I’d heard that he knew Crockett Johnson, and so I wrote him a letter. On the morning of Monday, October 16, 2000, the phone rang. On the other end of the receiver was … Andy Rooney! I couldn’t believe it. Here’s an extract from our conversation, with apologies for my poor interviewing skills. (I talked too much in the early interviews. Later, I became a better listener.) The “Dave Johnson” to whom Mr Rooney refers is Crockett Johnson — his friends called him “Dave” (his given name). Philip Nel: So, you were saying that he had a wide range of interests and was a good conversationalist, too. AR: Yeah. And to his philosophy, how that connected… (Laughs.) But one of the things I remember most about Dave. I was coming out of the post office in Rowayton, and I met him. I hadn’t seen him for a couple months, and I wondered where he was. And I said, “Where you been?” He said, “Well, I’ve been reading the Bible.” Well, you know, he was such a student. I mean, boy, if he said he’d been reading the Bible, he’d read the Bible. I mean, he spent about six months on it without letting any reference that he could track down go by him without his understanding it. PN: Do you remember when this was, that he was doing this? AR: Oh, it was two years before he died — what year did he die? PN: (Laughs.) That’s great. When did you meet Dave? Right after you moved to Rowayton or…? AR: Yes, we moved there in 1951. PN: He was living there then. PN: On Crockett and Rowayton there. AR: Yes, it’s right across the road from the harbor. It was a great house. Ruth was moderately crazy. She was a nut. But interesting. She would come to your house and, more often than not, fall asleep on the couch. PN: Yeah, a lot of people have said that about Ruth — that she’d come over. About half an hour later, fall asleep. AR: That’s right. And I knew never much about Dave’s professional football career, but I always admired him for it. PN: Yeah, I haven’t been able to dig up much on that either. I think he may have played semi-pro, because I haven’t found a trace of professional…. AR: He was big. I don’t know what his dimensions were, but he must have been 6’ 4”. PN: That sounds about right. AR: Yeah. But, it was so typical of his enthusiasm for something — getting into it. I’m certain that when he was wrapped up reading the Bible, he went to all the libraries, he would come in to New York and look up anything that he couldn’t find out there. PN: Yes, you see that throughout his life, I think — a wide-ranging interest in a lot of different things. PN: It shows up in the references in the “Barnaby” strips, there’s just a wide range of knowledge that shows up in there. It was a brief conversation — only 15 minutes. Andy Rooney (and his wife Marge, whom I also interviewed) did not know Johnson and Krauss well. They lived in the same Connecticut town. They were acquainted. Rooney clearly admired Johnson, and was kind enough to help out an aspiring biographer. While his TV persona may lead you to think of him as a cynic, to me (in our very brief conversation) he was not cynical at all. He was generous. He was kind. And I am grateful. Thank you, Mr. Rooney. Godspeed.